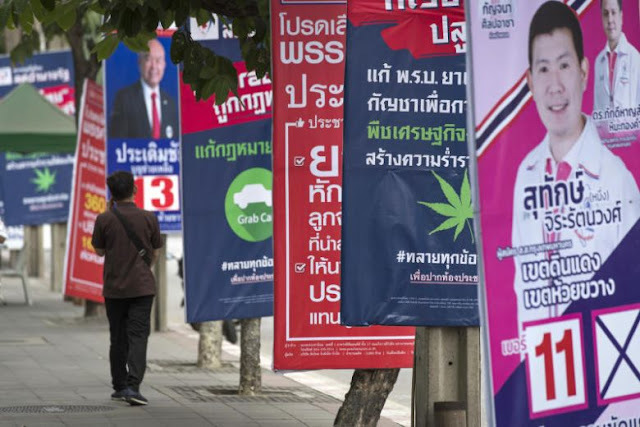 Media platforms either directly funded by the United States government or by their political proxies in Thailand, including US-funded Prachatai and Khao Sod English, have begun investing increasing amounts of energy into fueling a currently non-existent sectarian divide in Thai society. They are concentrating their efforts in promoting the activities of a small anti-Muslim movement in Thailand's northeast region often referred to as Issan. Issan - it is no coincidence - is also the epicenter of previous US efforts to divide and overthrow the political order of Thailand via their proxy Thaksin Shinawatra, his Pheu Thai Party, and his ultra-violent street front, the United Front for Democracy Against Dictatorship (UDD or "red shirts"). Shinawatra and his political proxies were ousted from power in 2014 by a swift and peaceful military coup. 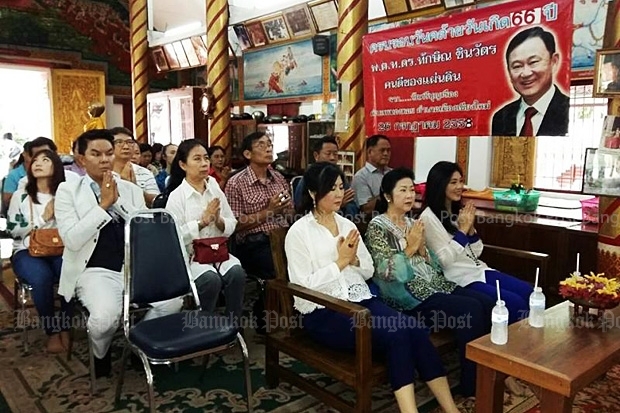 Today, temples affiliated with Shinawatra's political network are turning from a tried and tired, primarily class-based narrative, to one targeting Thailand's second largest religion - Islam, in hopes of dividing and destroying Thai society along sectarian lines. From northern cities like Chiang Mai to the northeast in provinces like Khon Kaen, suspiciously identical movements, with identical tactics, organized across social media platforms like Facebook are protesting Mosques, calling for specific acts of violence against Muslims, and using the same sort of factual and intellectually dishonest rhetoric peddled by veteran Western Islamophobes used to fuel the West's global campaign of divide, destroy, and conquer everywhere from the US and Europe itself, to Libya, Syria, Iraq, Afghanistan, and more recently, Myanmar and the Philippines in Southeast Asia. Myanmar, which borders Thailand, currently finds itself at the apex of nationalist and racist-driven violence targeting its primarily Muslim Rohingya ethnic minority. Groups of supposed "Buddhists" who form a more deeply rooted version of what the US and its proxies are trying to create in Thailand, were used to both create a deep sectarian divide where once there was coexistence, and to help put the US and European-funded political network of Aung San Suu Kyi and her National League for Democracy (NLD) party into power. 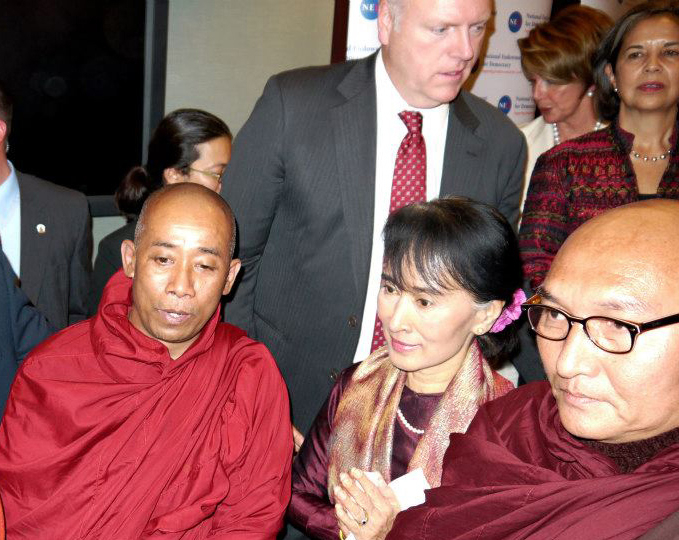 Image: Aung San Suu Kyi, sectarian extremists posing as "Buddhist monks," and the US National Endowment for Democracy (NED) together in Washington D.C. The humanitarian crisis created in Myanmar serves several functions for the US and its European partners who have meticulously cultivated it over the course of several decades. First, it allows the West to continuously hold significant leverage over the current government - one who at any moment may be tempted to break away from its decades-long Western sponsors and collaborate with a more local, sustainable, and constructive partner like China. Second, because the Rohingya crisis is highly localized to Myanmar's western state of Rakhine, it also presents a highly controlled conflict the US can use to introduce foreign-funded terrorism, and in turn, create a pretext for Western "counter-terrorism" assistance in the form of US and European troops, military assets, and even bases on the ground. A small contingent of Saudi-funded and directed militants has already been introduced into Myanmar's ongoing crisis and will likely be expanded until US military "assistance" and thus the first stage in establishing a permanent military presence in Myanmar can be justified. This would fulfill a long-term goal the United States has sought to achieve in Southeast Asia - the permanent positioning of US military assets in a nation directly bordering China. A similar scenario is unfolding in the Philippines - a nation that was decisively shifting away from Washington - a one time colonial power over the Philippines - in favor of closer and more constructive ties with Beijing. 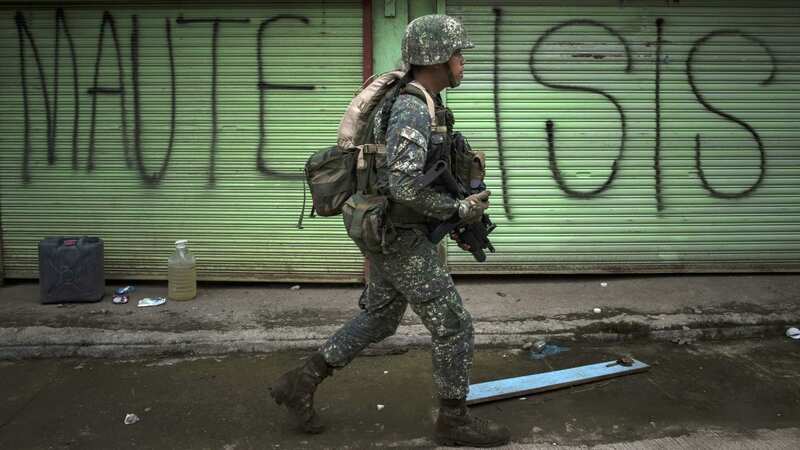 The nation is now faced with a sudden surge in foreign-funded terrorists - a surge so significant, militants managed to take over the southern city of Marawi resulting in full-scale military operations including airstrikes in order to retake it. Amid the manufactured crisis featuring terrorists sponsored by the United States' closest Persian Gulf allies - specifically Saudi Arabia - the US found itself with the perfect pretext to reassert itself militarily and geopolitically over an increasingly independent Philippines. The Mautes have pledged allegiance to the so-called Islamic State, and use many of the tactics that the terror group honed in years of conflict in Iraq and Syria. Despite vehement antagonism toward the U.S. and its military expressed by Philippine President Rodrigo Duterte back in December, after the Mautes moved on Marawi in May, The New York Times reported U.S. Special Operations Forces were here as advisers supporting Philippine operations in June. The Philippines represents the future of Myanmar once the crisis there reaches critical mass. For Thailand, the downward spiral of both the Philippines and Myanmar represents its own future should it allow the sociopolitical rot of sectarian divide take root at home. For the US - it has sought for decades to encircle and contain China along multiple fronts. This includes across Southeast Asia where US policymakers envision a united front composed of US-backed client states used to box China in - or a series of failed and dysfunctional states that prevent China from developing any beneficial ties with its neighbors to the south. Considering the success the US is having in the Philippines and Myanmar regarding its use of terrorism and reactionary sectarian division, it is logical that signs of US efforts in Thailand to do likewise are now appearing. Muslims and Buddhists have coexisted in Thailand for centuries, with Thai Muslims an integral component of Thailand's history and cultural fabric. Halal restaurants stand side-by-side Thai and Thai-Chinese cuisine, including those serving pork, in markets across the country. Mosques stand side-by-side with Buddhist temples. Buddhists and Muslims work side-by-side in businesses big and small nationwide. 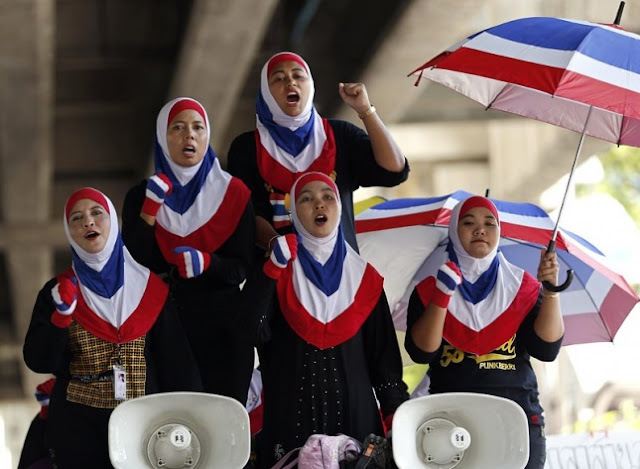 While Thailand has a violent insurgency raging in its southernmost Muslim-majority provinces, of Thailand's 7.5 million Muslims, only 1.4 reside in the deep south. The conflict is also seen as being primarily political, with militants targeting both Buddhists and Muslims in pursuit of their separatist goals. The rest live scattered across the country, and with significant communities coexisting in the capital of Bangkok itself. For most Thais, the notion of Islamophobia is another facet of intolerance associated with a corrosive and declining Western culture - not Thai. Yet there are still fertile grounds of profound ignorance, gullibility, poor education and lacking economic prospects that make a fraction of the population still vulnerable to otherwise childish, crass propaganda seeking to divide and destroy Thai tolerance, unity, and culture - primarily among the dwindling support base of US proxy Thaksin Shinawatra. 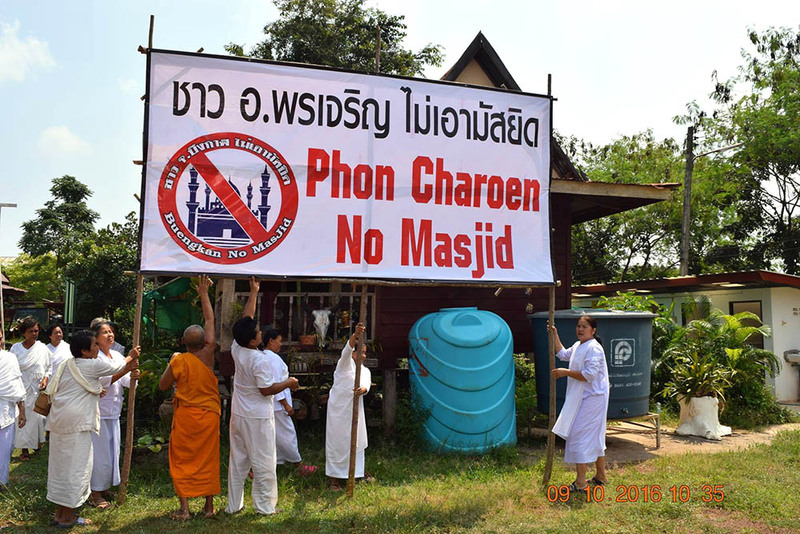 After Muslims in Khon Kaen registered a converted home as their place of worship – the northeast province’s seventh such venue – a local Buddhist group cited terrorism in its petition asking the governor to deny it. Last week, a Thai monk who has called for mosques to be destroyed in revenge for Buddhist deaths in the Deep South was seized by the military and flown to Bangkok to be forcibly expelled from the order. Pages such as No Mosques in Bueng Kan mix stories of violence in the Deep South with anodyne news stories involving Thai Muslims and toxic internet conspiracy theories about Muslims plotting to displace non-Muslim populations worldwide. The comments are filled with Muslim-bashing messages in Thai. And while the article appears at first to be laying the ground work to unequivocally condemn calls for specific acts of violence, bigotry, and hate speech, it adds an essential caveat - one used by the United States and its front of faux-rights advocates worldwide to shield both terrorists it sponsors, and reactionary fronts it encourages to divide and destroy nations. Ekkarin said the junta’s detention and defrocking of radical anti-Islam monk Apichat Punnajanatho last week was wrong despite the hate preached by the monk because it resorted to using special power of the junta by detaining the monk at military camps first instead of going through the proper channel of having the Sangha Order investigates the matter. This, Ekkarin added, could lead to resentment by some Buddhists, particularly his supporters, and backfire. The article, along with US-funded media front, Prachatai, appear to condemn the Thai government for its zero-tolerance stance on terrorsitic speech, bigotry, and hate. As the US and its network of media fronts around the world have done elsewhere, it is expected that attempts by the Thai government to stifle manufactured sectarian division will be systematically condemned by Western-funded fronts as violations of "human rights" and in particular, violations of "free speech." Prachatai - a supposed "independent media platform" entirely funded by the US government - published its own article regarding Punnajanatho and his calls to burn down mosques titled, "Buddhist authorities to defrock monks with ‘inappropriate’ online behaviour." In it, systematic complaints about the Thai government's interference with Buddhism are made, in an apparent attempt to call government intervention inappropriate and unwarranted. For the US-funded scribes at Prachatai, Thailand's best course of action appears to be to let the rot of sectarian division spread under the auspices of Western-style "free speech," just as it has in neighboring Myanmar. In even the most liberal nations on Earth, threats of specific harm against others or their property is considered a crime. Threats of death can be punished under US law with up to 20 years or more in prison. Likewise, deceiving people - particularly in a manner that causes physical harm - is also illegal and not protected under free speech. The classic "yelling fire in a crowded theater" example illustrates the very real harm intentionally deceitful words have and why it is not protected by free speech. Similarly, networks suspiciously overlaying US-proxy Thaksin Shinawatra's political networks, buried deep within his former political strongholds making specific threats of violence toward Thailand's Muslim communities is not "free speech." It is a crime and it must be punished swiftly and severely. Likewise, these networks propagating elementary lies about Islam in general, and about Thai Muslims more specifically, are designed to create social division and discord that will inevitably and intentionally lead to violence - as similar lies have done everywhere from across the West itself to neighboring Myanmar. It is the equivalent of "yelling fire in a crowded theater" with the specific goal of provoking dangerous and unwarranted hysteria, chaos, division, and bodily harm to those subjected to these lies. US-funded media fronts attempting to frame this reality in any other way - particularly in a manner meant to hinder the government from addressing it before it spirals out of control - is merely another example of how the US and its proxies hide their self-serving political agendas behind the principles of human rights advocacy rather than genuinely upholding them. They position themselves as accessories to criminals using threats and lies to divide and destroy peace and stability in Thailand, and should likewise be held accountable. 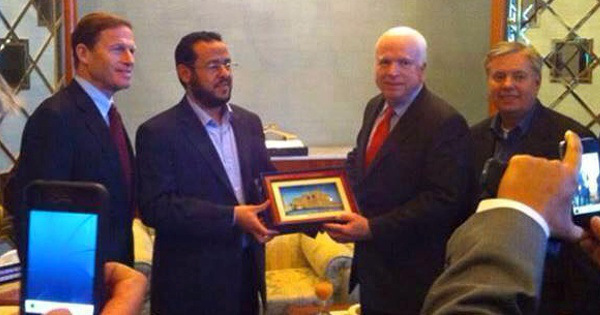 While US-funded organizations and political networks run by their proxies in Thailand attempt to work one side of this engineered sectarian divide, the Thai government must be quick to spot and address US-Saudi attempts to spur similar lies, deceptions, and provocations from the other side - among Muslim groups or those posing as Muslims provided with foreign cash and directives to help fulfill the lies being used to divide Thai society. Just as is done in the US and Europe - where Western governments fund and perpetuate both terrorists and anti-Islam movements to create a sustainable strategy of tension between both, they seek to likewise create a self-feeding crisis in Thailand where eventually staged provocations on both sides transform into real violence fueled by reprisals and growing distrust among previously coexisting communities. Thailand and other nations facing foreign-funded attempts to divide their society must take a proactive stance on exposing these efforts through intelligence operations and national media that serve national interests, fostering national unity, and creating clear and effective laws to unambiguously define and punish threats and hate speech - especially speech specifically designed to divide society and create violence. Failing to stop this sectarian divide from swallowing Southeast Asia may make the difference between a prosperous and peaceful future for the region, or perpetual violence and division as the West has successfully maintained in the Middle East since the end of World War 1.